To help students find their perfect school match, we offer a complete service tailored to make your child’s placement stress-free. Our experienced school placement consultants will provide guidance to you and your child throughout the application process. With our specialist knowledge of this sector we can provide advice on the schools you are applying to, what they look for in potential students and how to be successful in your application. Connexcel’s school placement are fully independent. We do not work on an exclusive basis with partner schools, allowing us to help your child find a place in any preparatory or senior boarding school they choose in the UK. Our personalised School Placement services are always designed to fit around your needs. Before beginning the application process, we take time to get to know you and your child so that we can understand exactly what you want from your prospective school. Determine the academic level of your child through our specially designed in-house pre-assessments. Pair your child with 3-4 potential schools that are best suited to their strengths and interests. Schedule meetings with our expert team of advisors who will establish a plan on how to approach the admissions process. Organise visits to your chosen schools in the UK where you will be accompanied by a member of our consultancy team – we strongly recommend these visits as they are an excellent opportunity to experience the schools first hand. 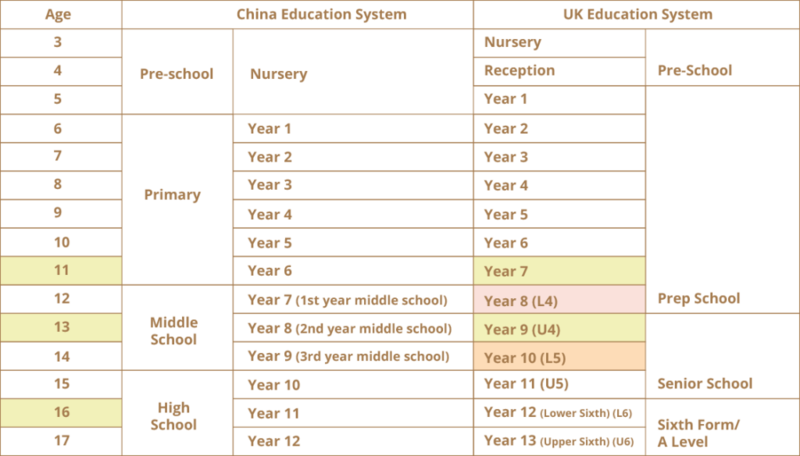 Schedule tuition sessions throughout the admissions process to help your child make the transition from the Chinese curriculum to their studies in the UK. Offer comprehensive assistance with all stages of your child’s visa application. Arrange guardianship and a host family that has been hand-picked to care for your child’s welfare during their residence in the UK. Provide you with our School Placement document pack that contains everything you will need to prepare your child for their future studies. 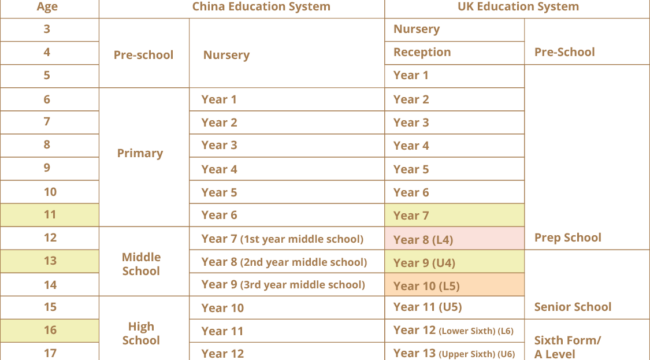 The main entrance point for the UK Independent school system are 11+ for Year 7, 13+ for Year 9 and 16+ for A Levels. Along with the main entrance points, our school placement services have guided students through many successful applications for the 12+ and 14+ entrance points. Please be aware, applications for 12+ and 14+ entrance points are dependent upon the availability schools may have and the student’s individual circumstances. To avoid disappointment in the placement process, we encourage that you register your child at least two years in advance at their chosen schools.